Swinging on your belly! Flying like superman! 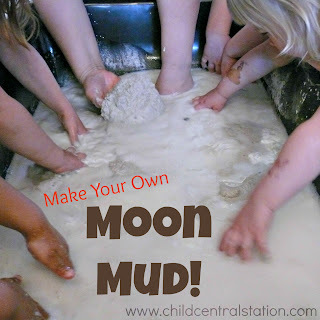 Any powerful play where children pretend to be someone or something else. Heroes are everywhere, not just on the big screen or from television shows. Moms and dads are prime examples of powerful heroes and many of the children engage in playing house and taking care of the babies. 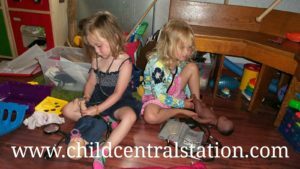 Additionally, children often dress up and pretend to be doctors or fire fighters. 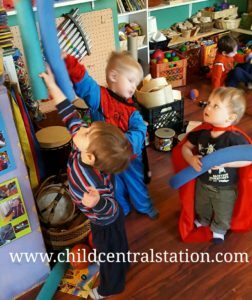 These heroes are prevalent in our program as well, as children are often doing their best to "save the day!" 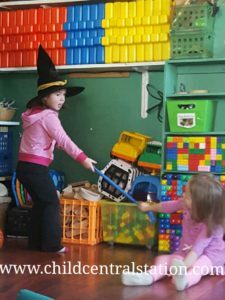 Some of the powerful make believe play also revolves around "bad guys" and "super villians" and most often "monsters" and "witches." 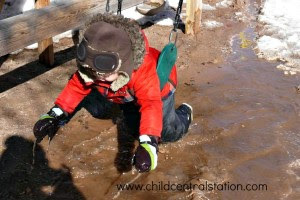 Children work through their world via play, so it only makes sense that they also bring the "bad guys" into the picture. It gives them an opportunity to work out social situations and deal with the dichotomy of good and evil. I had such a difficult time chosing which photos to share with you in this post. 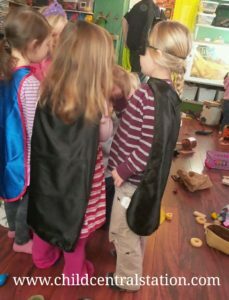 Super hero play happens on a daily basis! Here are a few shots highlighting a couple of our favorite kinds of props! Hooded bath towels make fantastic capes. I know some people worry about chocking with capes, especially with younger children and these hooded towels eliminate that fear/risk. They come in all kinds of varieties. 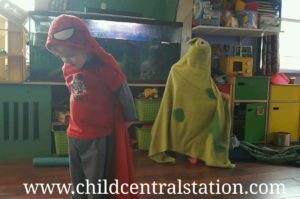 Sometimes the children use them as the character they are intended to be, and sometimes they are just capes! 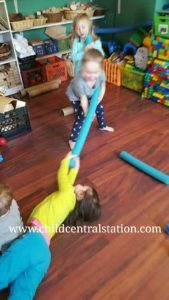 Pool noodles are awesome! In addition to being great swords, they also make great "ropes" as seen in this photo. HOLD ON TIGHT! I'll save you! These capes pictured above were found at our Dollar Tree. They are awesome. Super simple, attach with velcro and we have an abundance of them so that that everyone can be a superhero! How do you promote super hero play in your program? I'd love to hear from you!